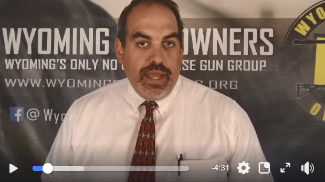 By now you’ve likely heard about the SIG P229 giveaway that Wyoming Gun Owners is conducting. But just in case you have missed out on this, I’ve asked our Policy Advisor, Aaron Dorr, to produce this video update for you. You can watch that video update right here! Simply put, it’s decision time for gun owners in Wyoming. Or are we going to stand up and fight back against the gun control onslaught being pushed in the media and by Michael Bloomberg’s radical gun control groups? If you agree that we must stand and fight, please sign your Second Amendment turnout pledge at once! Once you do, your name will be immediately entered into the drawing for a SIG P229 pistol! And remember, any contribution you can make to help Wyoming Gun Owners defend the Second Amendment in Cheyenne would be most appreciated. But, during this special program, any contribution of $35 or above comes with a FREE WYGO T-Shirt and decal! So please consider your most generous contribution today! P.S. With critical elections coming up later this fall, will you sit on the sidelines, or stand and fight for the Second Amendment? If you do, your name will be entered into a drawing where you could win a SIG P229 from Wyoming Gun Owners! And as a part of this program, any donation of $35 or higher comes with a FREE T-Shirt and member decal from Wyoming Gun Owners! Video Update: Who is the Pro-Gun Candidate in House District 30?